Profile picture makes first impression on any Social Network. Not just profile has your photo but networks like Google+ and Facebook allows covers to express yourself more. 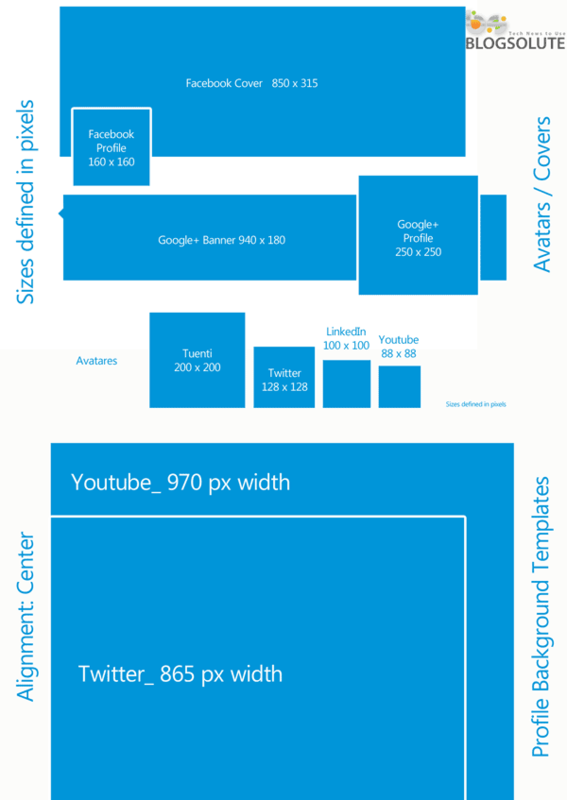 However, common question arising in your mind is: What is the size of Facebook cover, which picture will look good, etc. Recently, I created a custom cover for my Facebook profile. Before you are working on it, you should know pre-requisites such as dimensions to fit exactly that box and should not get interfered by profile picture box. I could test out the stuffs before making the cover public only because, I was aware about its size. This is always indicated on all Social networks while most of them automatically adjust your photos to fit in the box. But, if you create a picture which is exactly as per their requirement, you will get to know how will it look even before uploading. The top includes formats and sizes for profile picture and cover Facebook and Google+ and avatars of Twitter , Myspace , LinkedIn and Youtube . The bottom includes content blocks Youtube and Twitter. Note that these blocks are to be centered within an image with greater width and some users may not see all the content if your resolution is lower than normal. The height is your choice. You can use the image that we have shown as a reference or use the template in PSD in your image editor directly. If you are using the image as a reference, pixel sizes of each block is mentioned, so you can create a new document in your graphics editor with corresponding dimensions. If you use Photoshop template, place the photo you want to use for your profile within the document, in a new layer, and adjust the size of according to block. Then save the result as a new image in JPEG or PNG. For background templates for Youtube or Twitter, you can drag the layers to block content to a new document.